O.k. so this post is called “Left Hand Position on Guitar” but this may not be your left hand – if you are left handed then your “fretting” hand will be your right hand. Maybe more accurately we can call this your fretting hand. Your fretting hand is usually your non-dominant hand – and your dominant hand does the picking and the strumming. Anyway, the point of this post is to discuss the proper positioning of the fretting hand and how to use that hand properly. Your fretting hand is the hand that presses down on the strings. It is the main creator of the melody and the chords. How you position your fretting hand will make a difference to how well you can play the guitar – simple as that. Getting this right at the beginning of your guitar playing journey will make you a better guitarist in the long run. Your thumb should be positioned behind the neck of the guitar or resting on the top of the neck. Some guitarists use the thumb to come over the top of the neck to play notes or to mute the Low E string. But this is a more advanced technique. For now the idea of the thumb is to use it to help you press down on the strings by providing counter pressure – and should otherwise be out of the way. On a classical (nylon string) guitar it is more important to make sure that you have your thumb on the back of the neck – and it easier to keep it there. This is because the fingerboard is wider and the neck often has a deeper profile. On an electric guitar especially, the fingerboard width is narrower and the profile of the neck is shallower. Whilst it differs depending on the steel string acoustic guitar you have, on a steel string acoustic guitar the neck is closer in width and shape to an electric guitar than it is to a classical (nylon string) guitar. There is a bit more leeway for a thumb to be higher on the back of the neck. 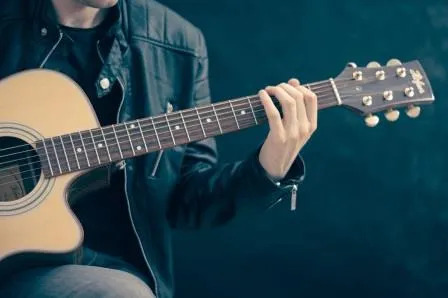 If your thumb is too high up the neck, or resting on the top of the neck on a guitar with a wider neck you run the risk of muting the high strings of the guitar with the palm of your hand. Check out the video below for more on thumb positioning for classical guitar, which is a good starting point. Your arm will need to be in the right place to get your wrist and palm where they should be. Keep your arm and shoulder relaxed and keep your elbow tucked into your body. Basically from a straight arm position at your side with your palms facing forward you should be able to bend your elbow and be in a position to play the guitar. If you find your elbow moving away from your body (chicken winging), tuck it back in. Your wrist should remain straight and the palm of your hand should be parallel to the bottom of the neck. Your palm (at the base of your fingers) should sit below the neck. It should not be touching the neck. When you are doing things such as bending, virbrato, etc, then your wrist may move from this position but this is the starting point. Remember to keep your fingers and hands relaxed though. Don’t tense everything up. Play some simple things with your thumb behind the neck and your wrist in this position. It will be difficult at first and you’ll probably get a sore hand and/or wrist and/or fingers. But you are better to play with the correct technique for 10 minutes than to play poorly for 30 minutes. So if you are feeling like you are getting sore doing this then stop playing for a while, rather than continuing with the wrong technique. As you become more advanced you’ll find new positions and you’ll find you’ll need to adjust your position at times for certain chords and techniques – but use this as your foundation. Check out the video below to see an example of this. With your thumb, wrist and palm in the right position, your fingers should naturally be in the right position. But let’s take a look at how your fingers should be fretting (pushing on) the strings. Here are a few tips to make sure that you are getting a good sound out of your guitar. Which Part of the Fingers should Fret the String? You should fret the strings with the tips of your fingers. This is hard to do if your hand is not in the right position. You shouldn’t be fretting with the front part of your fingers. If your nails are too long this can be difficult. This is why you sometimes see guitarists who have short fingernails on their fretting hand and long fingernails on their plucking hand (if they play fingerstyle with their nails). Where in the Frets should the Finger be? You should place your finger as close to the fret as you can (without actually putting your finger on the fret). The best sound is achieved when you place your finger close to the fret. So if you need to place your finger in the second fret, it means that you are placing your finger between the 1st and 2nd frets – but it should be as close to the 2nd fret as possible. With some chords, you aren’t able to get that close to the frets and that’s fine, just try to place your fingers as close to the frets as possible. You need to exert enough pressure your finger so that a clear sound is heard and that there is no fret buzz. A buzzy note is often a sign that you aren’t pressing hard enough (though it could also mean that your guitar needs a setup adjustment – if you press as hard as you can and you still get fret buzz then it’s likely that your action is too low). So, you need to exert enough pressure to sound a clear note. But you don’t want to be pressing as hard as you can every time – you’ll get sore fingers and hands after a while. So you want to play relaxed too – you want to try to find that nice balance of playing lightly but with just enough pressure to get a clear sounding note. After a while – if you are practicing with good technique – this will become second nature and your playing will start to sound smoother and smoother. Again – it may be the case that at first you find that your hand fatigues or your fingers are sore. Just keep your sessions short – you want to be practicing right for a short amount of time – not wrong for long periods of time! What you practice will become a habit – so if you practice the wrong thing a lot then it will be much harder to start playing with the proper technique. You should be able to play for a while like this though. Another reason you might be fatiguing is that your guitar’s action is too high. Check out the link below to see if your guitars action is too high or too low. You don’t want your set up to stop you from practicing properly. The video below is the best overview of fretting hand technique that I’ve seen and it’s a great place to get started with fretting technique. Thanks for reading and I hope that this helps with your fretting hand technique! I really enjoyed reading your post, it was very interesting! I like the videos, it is much easier to learn by watching someone else playing guitar. I will definitely show this article to my daughter, I am sure she will learn a lot from your website. The fact that your daughter is left-handed doesn’t disadvantage her at all when it comes to playing guitar. This post is titled left hand position on guitar – but more accurately it should be titled fretting hand position on guitar. This same technique applies to left-handed guitarists – it’s just that their right hand is their fretting hand. There are many awesome left-handed guitarists out there – Jimi Hendricks being one of them, of course. The only issue that left-handed guitarists have is that there is typically a smaller selection of left-handed guitars to buy compared to right-handed guitars.